Hi! It’s Karl here from Buzz Website Design and I just wanted to give you a quick idea on how to use exciting things that are happening in your marketing to get that little bit of extra fun or little bit of extra boost in what you’re doing and the impact that you have in your marketing responses. Now, at the moment and it’s the end of December 2015, unless you’ve been living under a rock for the last few months you can’t help but have noticed that Star Wars is here. I’ve seen the film and it’s fantastic. If you haven’t been, please go and see it. I promise you’ll enjoy. But, anyway, what does that mean to us as a business? Well, the key is it’s a hot topic. One of the things I’ve realized many times is that very few small businesses take advantage of hot topics right now. A number of years ago, we had the Olympics here in Britain, in London. A lot of small businesses were trying to leverage that. Since then, we’ve had the Rugby World Cup here in Britain and, again, a lot of small businesses have leveraged that. In Leicestershire here, we’ve got the Football Club, which at the moment is at the top of the Premier League. Can you leverage that? The point is that there are so many exciting things happening at any one time to do with you, to do with your business, that your audience might be interested in. Now, is there a way that you can take advantage of that? Is there a way that you can use Star Wars in some way, shape, or form to promote something you’re doing? A Star Wars special offer – “May the Force be with you.” However you want to frame it, the key is it’s timely and it’s relevant. The great thing is, if you can do it with a bit of tongue-in-cheek, it will often get noticed by people more so than almost any other marketing thing that’s happening in their world. 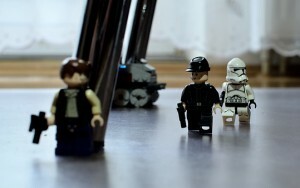 Using Star Wars in your marketing could help to boost your impact and response rates. We get bombarded with stuff all the time. But often, if something stands out, being that slightly bit different, or relevant, or timely, or on a topic that’s very popular at the moment, it will stand out over and above this. The great thing about it is all you’ve got to do is pay attention. Now, there is a word of warning though. Star Wars, for example, is owned by Disney. If you go stealing their music or pinching their images, etc., you might get into trouble in your marketing. But, there’s no reason why you couldn’t commission somebody else to do something for you. Have a look on websites like Flickr where people create art and ask them if you can use something of theirs. Anyway, the opportunity is always with us. You don’t have to be a Star Wars fanatic or a big fan to take advantage of that. You don’t even have to like sports to take advantage of something that’s exciting. But, I would encourage you to try and leverage what it is that’s happening in the news, in the world, in the media, in sports, etc. to create a marketing message that reaches out to your audience in a way that may be applicable to them, but it certainly might chime with them because of everything that’s happening around at that time. So, I hope that helps and good luck. Go get it done! If you’d like help with using Star Wars in your marketing (or any other topical theme) then give us a call on 0116 3552194 and we’ll have a chat.